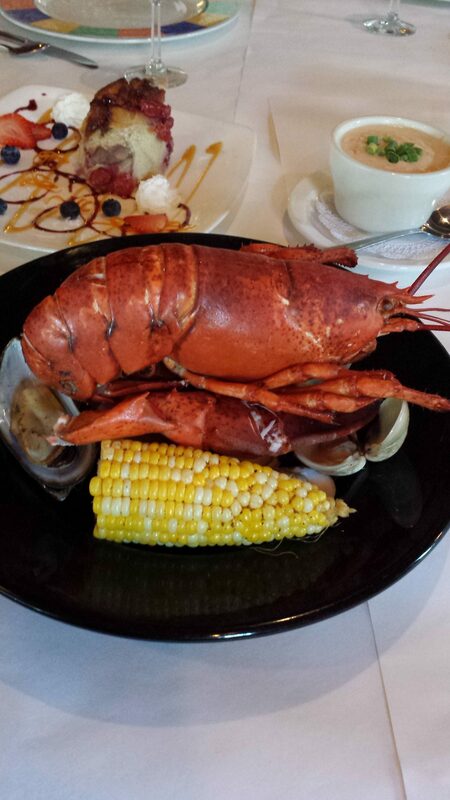 Our traditional New England lobster boil is served every Wednesday, Friday, Saturday and Sunday evening. It is a three course dinner and is so popular that we serve approximately forty lobsters each night during our summer season. We serve our lobster boil in addition to our regular menu and we take reservations for the lobster boil along with our regular dinner reservations. We take dinner reservations daily from 4:30 pm until 9:00 pm. We do recommend reservations and ask that you let us know if you are considering the lobster boil so that we can be certain to have plenty of lobsters on hand. Reservations can by visiting our Facebook page or here on our website directly. We have a wood fired pot located between the windows overlooking the water and the water’s edge. If the weather isn’t cooperating, we do have an area in our kitchen where we can prepare the boils so you won’t be disappointed if you are joining us on a night that we cannot use our wood fired pot. Since we serve the boil as an addition to our regular menu, some nice person from our kitchen will be running back and forth all evening dropping lobsters and taking them out. You are free to join him or her at the pot to check on the lobsters’ progress! Picture taking is always welcome! First course is a cup of our creamy Maine lobster bisque. The second course consists of a 2 pound live Maine lobster, baby red potatoes, fresh corn on the cob, New Zealand mussels and steamed clams. And, the third course is a generous portion of our homemade Door County Cherry Bread Pudding. The price is $55 per person.